Several recordings were made by the group, most of which were original tunes. 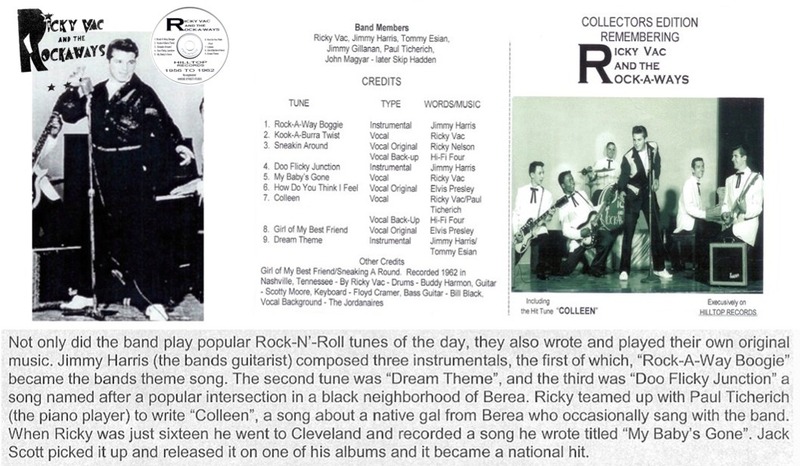 One of the songs written by Ricky Vac and Paul Ticherich was called "Colleen". It was released on the Hill-Top record label which was a subsidiary of DOT Records. 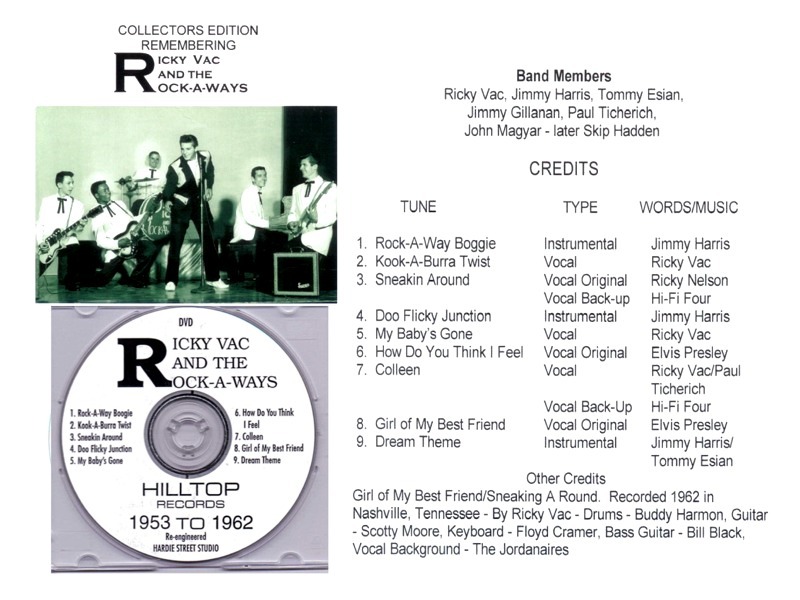 Ricky Vac and the Rock-A- Ways performed that tune on the Danny Thomas "National Heart Fund" television show. By late 1961 the group was performing to sell-out crowds. Just as it looked like National recognition was close at hand, the group experienced a few setbacks. This band was one of a few Cleveland groups playing Rock 'N' Roll music. They were performing when Alan Freed was Cleveland's most popular Disc Jocky. During those years the group worked on many shows with groups like "The Flamingos" and Frankie Avalon. Jimmy Gillahan was replaced by Skip Hadden, and John decided to leave the band for personal reasons and was not replaced. With the group again stabilized, a record was made titled "My Baby's Gone". This was a tune written by Rick Vac back in 1959. It was recorded at Audio Stu­dios in Cleveland. Ricky Vac & The Rock-A-Ways perform­ing that song and stole it! This tune was released on his forthcoming LP and appears on many compilations of that artists work that are still available today. in downtown Cleveland. The Rock-A-Ways were the anchor band for the show. The band also played on television and appeared at many civic events in the area, as well as touring other states. In 1962, Ricky went to Nashville, Tennessee, where he recorded "Girl of My Best Friend" with such great artists as Buddy Harmon, Scotty Moore, Floyd Cramer, Bill Black, and the Jordinaires. The Rock-A-Ways' music can still be heard on radio today on Oldies Radio 88.3, WBWC-FM, with Greg Miller on Saturday nights between 6 and 9 pm. In 1962 the Army came calling and Ricky Vac became Private Vaculig. 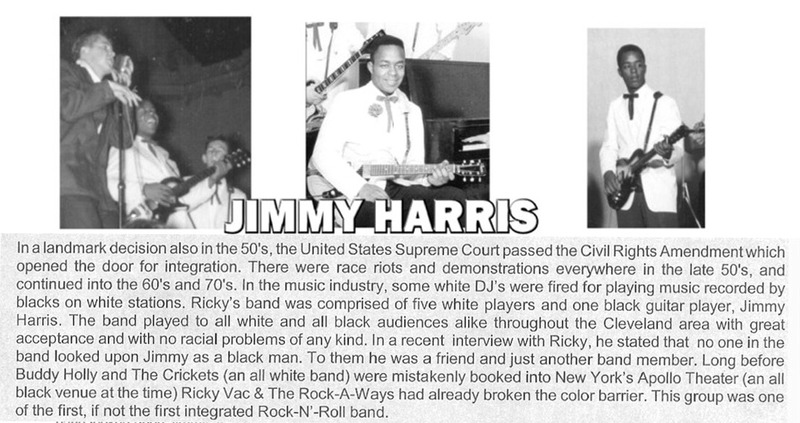 By then the band had played together for six years, from 1956 -1962. Ricky Vac and the Rock-A-Ways, vocalist and combo known to many area residents, have signed a recording contract this week with HilltopRecords. 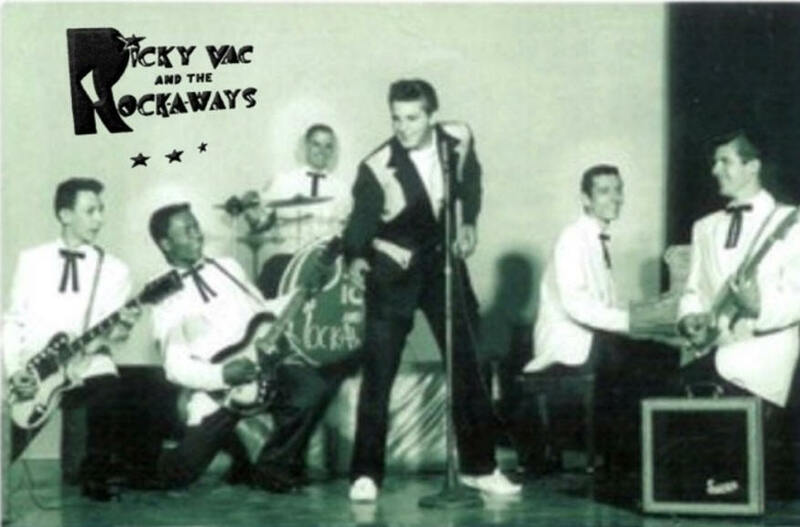 ROCKING AND ROLLING with a beat are Ricky Vac and the Rock-A-Ways. The combo mem­bers, left to right, are John Maygar, Skip Hadden, Jimmy Harris, Ricky Vac, Paul Rich, and Tom Esian. Young Ricky Vac, formerly of Edgewood Drive, is now a resident of Olmstead Falls, and while not in rehearsal or filling engagements is employed by a local construction firm. Composed of five musicians, the group is managed by Carl Handel 26810 Bagley Rd„ Olm­sted Falls. Handel, who was instrumental in activating the group, has managed them since March of 1959. Since the age of 10 years. Tom is a 16 year old junior at Olmstead Falls High School, and has studied guitar for five years under the instruc­tion of King Gardner. The combo's only change since its beginning is the new drummer, Skip Hadden, son of Mr. and Mrs. Dudley Hadden, 6094 Morrow Dr., Brook Park, who attend Berea High School, and joined the group in January. Recent appearances of the group include a WEWS Tele­vision show, the Westlake Yacht Club, WHK Record Hops, and just recently appeared before a record crowd at Euclid Beach Park.